I recently found myself in need of a lightweight stroller that would live in the back of my car (l knew I was going to pull a serious back muscle if I kept lugging my 32 lb City Select around every day – gah!). I decided to try the Zoe XL1 BEST v2 stroller because it’s super lightweight and offers a ton of features for a decent price. There were two main things I was after: at just 11 lbs, it’s super lightweight, and it also has an enormous sunshade — check out this 4-panel shade…w00t! No sunburns for this tot! This stroller was a cinch to put together right out of the box. All I had to do was click the wheels into the frame and we were ready to roll. This was a nice little perk, since putting together some strollers requires an engineering degree. The Zoe Best v2 has 50% larger wheels than the first version did (6 ¼” rear wheels and 5 ⅜” front wheels) to help it handle rougher terrain (this was a complaint of the previous version). With the new version (“v2”), I’ve had no problem pushing it on pavement, packed dirt, or grass (it rolls really nicely, even when pushing it with one hand). The only surface it hasn’t been able to handle was a loose gravel path we encountered on one of our outings. Just a note: if you need to roll over rough terrain, you should opt for an all-terrain stroller (this is not one of those…). Despite the light weight, this stroller is quite stable — even with my diaper bag hanging on the handlebar of the empty stroller, it didn’t tip backwards. What wizardry is this? The handlebar on this puppy is 40.25” tall. For reference, I’m 5’8 and it feels comfortable to me, though I wouldn’t complain if they were to add a telescoping handle so I could go up another inch or so. Despite my height, my feet don’t kick the bottom rear of the stroller unless I’m taking really long strides. One thing we love (in general) about the Zoe brand is that you get some sweet extras for things you normally have to pay extra for, including a parent cup holder, a kid cup holder and snack cup (game changer! ), and a belly bar. Younger babies will enjoy holding onto the belly bar, while toddlers will appreciate having their sippies and cheddar bunnies within easy reach (or their toy chickens, in my daughter’s case). The rear shade (which can be rolled up) includes a pocket which fits a cell phone, keys, and doggy bags (because the dog has needs, too). The basket under this stroller isn’t the largest or the strongest (since it’s made of mesh), but it can fit my whole diaper bag, which is all I can really ask of an 11 lb stroller. The foot brakes are located above each rear wheel and are simple to use (above). Note: you need to make sure to push the brakes down all the way, as they aren’t fully engaged until you feel two clicks and can’t push them down any further. Not realizing this at first, I only pushed them halfway and the stroller began to roll — yup, I learned that lesson fast! I’m a big fan of the seat and harness on the Zoe Best v2. The seat holds kids up to 50 lbs and is quite tall; for reference, my very tall 3.5 year old still had 2-3 inches to spare from the top of his head to the canopy. It has a nicely padded harness that’s easy to adjust. The seat is very easy to recline (its max recline is 165 degrees, which means this seat is for babes 6 months and up — not for newborns). The Zoe Best folds easily with one hand – just pull up on the seat handle (which is easy as pie, since it’s so lightweight). You can do this while holding a kid in your other arm if you need to. 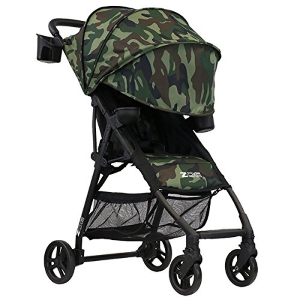 Something to note, however, is that this stroller does not have a standing fold to keep the fabrics clean if it’s in your garage – though this won’t matter if you’re keeping it in your trunk. If you know you’re going to want the second seat, you can save some money by buying the whole shebang, the Zoe Tandem Stroller ($279), instead of buying the tandem seat separately. Bonus: it comes apart so you can use it as a single or a double. For a side-by-side, Zoe also makes the beloved Zoe XL2 Best v2. You can also buy a parent console, travel backpack/storage bag, single or double carry straps (so you can wear it over one shoulder or like a backpack), a weather cover, a belly bar cover, and a removable comfort pad/pillow. You can also get a buggy board for an older child that the Zoe peeps pinky-promise will fit this stroller (though you’ll have to adjust how you push the stroller so your feet don’t keep hitting the board). The Zoe is one of our favorite travel strollers because it’s super light, simple to fold, and easy to maneuver and push around with one hand – and it does this all without skimping on any of the features parents really need. Bonus: if you’re not picky about which color you get, you can snag one of these puppies for just $129 on Amazon! Overall, if you’re looking for a super lightweight stroller for daily use and/or travel that offers fabulous sun protection and comes loaded with extras, the Zoe XL1 V2 will not disappoint. Thanks for the great article. Is Zoe compact enough and can fit in an overhead compartment for air traveling? The Zoe XLC is I think. It’s almost identical to the XL1 but compact enough for overhead compartments. I ordered the stroller and it took forever to ship. I got a nice email from the company explaining the delay. I appreciated that and patiently awaited my stroller. Finally it arrived and we loved it. Unfortunately it BROKE WITHIN 1 WEEK OR LIGHT USE! I submit my claim through their site. The site said they would get back to me within a day or two. It’s not been 8 and counting and I have heard nothing. Not even an email to say we need more time. Now I am stuck with a useless stroller with the bottom basket hanging off the frame. Again, this is from 1 week of light use! We only put the SkipHop changing pad clutch in there and used it for maybe 5 outings! I am now worried that I cannot get a refund and they will send me a new one that will break easily too. And even if they accept a return of the stroller, I will get stuck with useless accessories. I get there are a small company but they need more staff. I’d rather pay more for better quality products, or at least decent customer service. I have a Zoe XL1 Best and we love it also. Bought ours April 2017 and so far so good. It stays in our trunk and we mostly use it for running errands in and out of shops; going to the zoo; and walks to the park. My husband is 6’4″ and he’s comfortable pushing it around 🙌. We have the double side by side and it is amazing! I purchased one that was open box and got it for $200 despite it being brand new. I use it every day for my two babies. The size is so easy to get through doors. We LOVED this stroller on a two week European vacation. So light and easy to fold, and the extended canopy helped my toddler take naps easily even though it doesn’t quite fully recline. It rained nearly every day of our trip (Norway and Iceland) and I was so thankful we got the rain cover. It fit like a glove and my kid was so happy and dry in there. 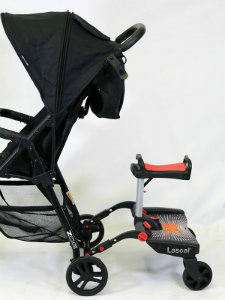 Seriously, I spent months researching strollers and my whole family was beyond impressed with this one. I’m surprised the customer above had a bad experience. We were missing the optimal color wheel caps, and they sent them overnight. Ours also held up with daily use of many many miles per day on cobblestone, plus being thrown around the baggage claim on eight flights. Hopefully the company is still great – I still love this stroller and an debating buying the tandem or a double stroller to use with baby 2! I got the same stroller for the same reason and love it! Super light, easy to open and stores great in the trunk. I loved all the extras it came with too. I’m sad to hear the feedback on the customer service, as the small family company was one aspect I really liked — I try to support them as much as I can. Wow! I am really surprised by Dana’s poor experience. I have owned my Zoe for 8 months now and use it everyday. No breaking or major wear. 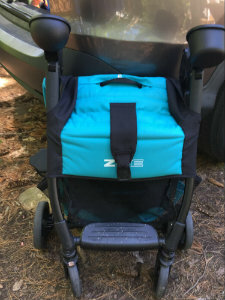 My best friend owns one too and her bottom basket broke after trying to shove the diaper bag in there and the Zoe sent them a brand new stroller! I’m hoping it’s just a really busy time for them with the recent launches and they will get back to Dana. To answer the other question, yes it will fit in the overhead compartment. I have the backpack travel bag for mine and have always put it in the overhead – going on 6 total flights. I don’t know that it meets the required measurements, but no one has ever stopped me!